CRICKET pitches have been ‘reintroduced’ to Molesey Hurst Recreation Ground to replace those that were lost years ago. A square of seven turf strips and one artificial strip were in- stalled at the rec behind Hurst Pool in June by Elmbridge Borough Council. 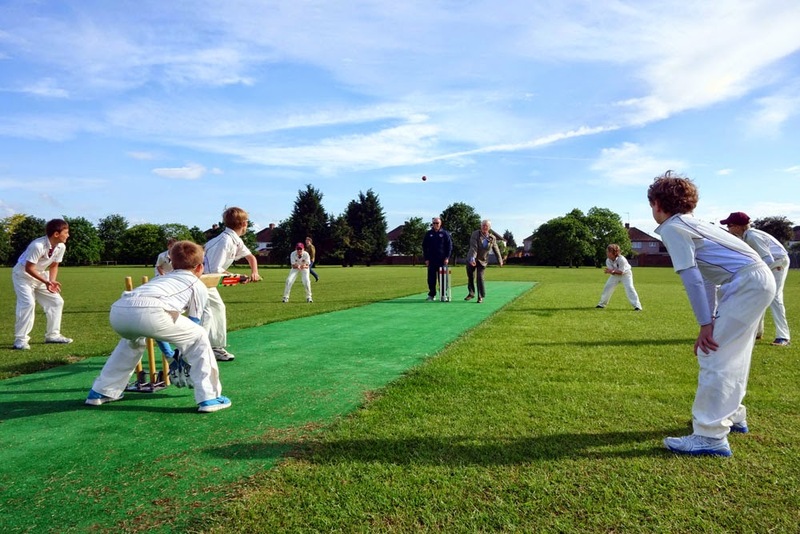 The grass wickets will ready in 2015 once the fine turf has fully established itself, but the artificial strip is already in use (pictured are the East Molesey Cricket Club Colts training on it with Councillor Barry Fairbank, the Mayor of Elmbridge). The Council says the artificial strip provides “realistic bounce and spin, enabling youth cricket to be played in all weathers”. It should come in handy for East Molesey Cricket Club which has been seeking new facilities for its Colts aged 5–17, and wishes to expand girls and disabled cricket provision. It can also be hired by non clubs for £25. The Molesey Conservative Residents often hear it said on doorsteps that there is not enough for young people to do in Molesey so we welcome the new facilities. The £28,150 price tag sounded surprisingly high to us, but on comparing prices online we discovered a new cricket strip can be anything from £3,000 to £7,000 with install and ground preparation! Nothing is cheap these days it seems. Additionally councillor Steve Bax recently had a chance to inspect plans for a new children’s play park in East Molesey. The play area will include a trim trail and various climbing frames, and will be created on land at Barge Walk off Graburn Way, and adjacent to Molesey Boat Club. It will be a replacement for the very basic existing children’s park which is being removed to make way for the boat club’s proposed indoor rowing tank. The new equipment and install is expected to cost £60,000 with 10% of the money coming from the boat club. Elmbridge placed the order in June and is hopeful of the facilities being open during the summer school holidays. There will be a chain link fence and picnic benches. While an existing shelter is being removed.